Aircraft crashes are caused by many reasons, the most common being bad weather and technical malfunctioning. Learn about some of the deadliest aviation accidents in history. The worst aviation accident is believed to have occurred on March 27, 1977 when two Boeing 747s, operated by KLM and Pan Am, collided in Spain’s Canary Islands. Around 583 people casualties were reported. As the map shows, the second-most deadly air crash accident took place on August 12, 1985 when a Japan Air Lines 747 crashed near Mt. Fuji. The plane had taken off from Tokyo. Over 520 people were estimated dead besides many injured. Technical malfunction resulted in the disaster. 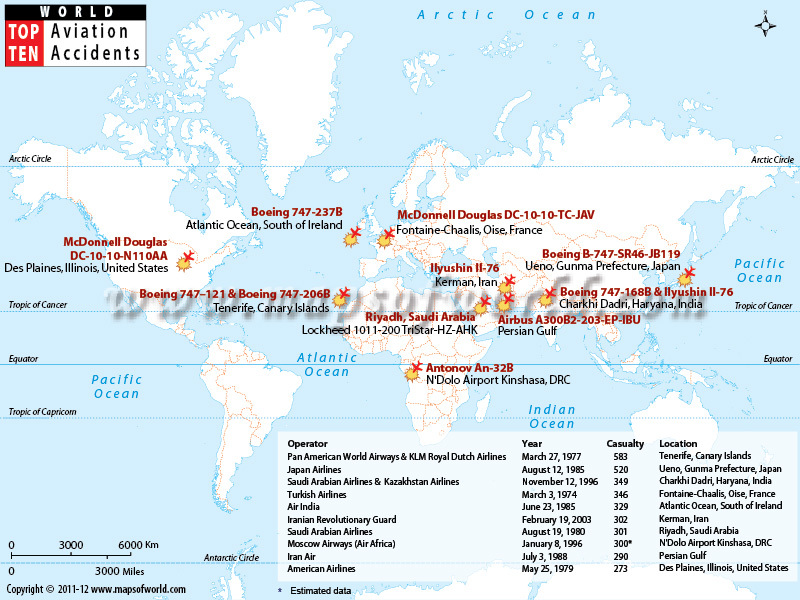 The Top Ten Aviation Map also shows the location and the details of the other tragic air craft crashes. As shown in the map, the most recent air craft accident took place on November 12, 1996 in India near Delhi. The accident occurred when an Ilyushin IL-76 cargo plane from Kazakhstan collided in mid-air with a Saudi Arabian airline Boeing - 747. All the 349 passengers on board were killed; it is supposed to be the the world's worst midair collision.